The van drive from the Sierra Brava Lodge to Estancia Los Chañares lasted only thirty minutes, but our arrival was heralded by an explosion of brilliant flowers that clearly showed we had stepped up a notch in amenities. Estancia Los Chañares enjoys a reputation as being among the most luxurious wingshooting destinations in Argentina. The front patio and lounge area accessible by large glass doors are floored with Spanish tile. Plush sofas invite conversations. Across the lawn was a swimming pool and outdoor grill. A long picnic table was set with crystal, white bone china, hefty flatware and bottles of Argentinian Malbec in preparation for a mixed-grill lunch under a picturesque shade tree. My friend, Rick Cundiff, had accompanied me from Sierra Brava Lodge to Estancia Los Chañares, and we were impressed with our rooms. The accommodations featured opulent materials including tile and marble, which offered an upscale aesthetic that honored the Spanish heritage. At the same time, a timbered, dark wood ceiling complemented the harder surfaces with a warmer feel. There were two twin beds with plenty of space to move around and stow your gear. The private bath was elegant and spacious. Rick Cundiff in a dove blind at Estancia Los Chañares. The indulgence distinction between the Sierra Brava Lodge and Estancia Los Chañares is by design. Both are owned by Flyways Argentina whose principal is David Perez. In addition, Flyways Argentina operates two other lodges in Córdoba, Posta del Norte and the Paloma Brava Pigeon Lodge. The Sierra Brava Lodge and Estancia Los Chañares are the only destinations in the group recognized by the exclusive Beretta Trident Program. Overall, the idea behind the Flyways portfolio of lodges is to satisfy the diverse criteria of wingshooters. The Sierra Brava Lodge is the most affordable, and as we noted in the first part of this series, it’s beautifully rustic, immensely comfortable, with exceptional food and avuncular bird boys. Next up is Estancia Los Chañares. Posta del Norte is just as sumptuous as Estancia Los Chañares, but more intimate with six double rooms that have private baths. 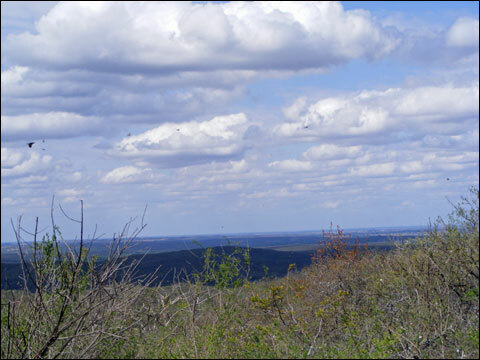 Posta del Norte is ideal for shooting parties of up to 12 guns who want to lease an entire place for a private hunt. Aerial view of Estancia Los Chañares. 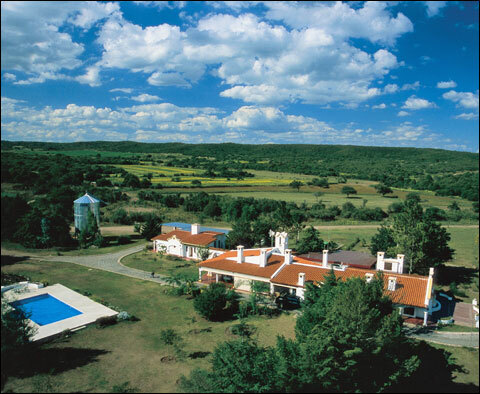 Paloma Brava Pigeon Lodge is the newest addition to Flyways Argentina. While the wild dove hunting at the other three Flyways destinations is unlimited, there’s a maximum of 200 pigeons per day at Paloma Brava. It’s a one-to-two hour drive from the Flyways dove-hunting lodges to Paloma Brava. Flyways generally recommends a half-day dove hunt combined with a decoyed pigeon hunt at Paloma Brava Pigeon Lodge. But the clock was ticking and we stayed put at Estancia Los Chañares. Now on the last leg of our six-day hunt to the two Beretta Trident Lodges, I was on a specific mission with precious little time left to fully prove my assumption: to determine whether or not a 12-gauge was overkill, compared with more traditional sub-gauge shotguns, for high-volume dove hunting in Argentina. My shotguns of choice were two Berettas: an A400 Xplor Unico Light semi-auto with the Kick-Off recoil-reduction system and the Beretta SV10 Prevail also equipped with Kick-Off. As Beretta explains it, the Kick-Off hydraulic dampening reduction system cuts recoil by some 44% more than its closest rival through the use of two hydraulic recoil dampers incorporated into the stock that compress after the shot – absorbing recoil that would otherwise pile-drive straight into your shoulder. 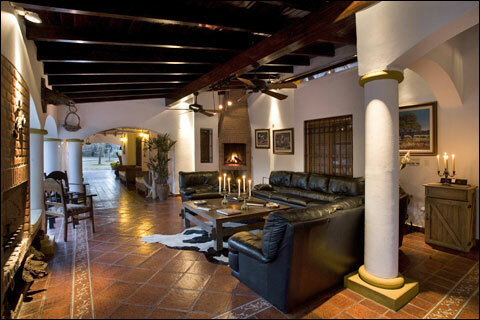 The lounge area at Estancia Los Chañares. During my first stint with the guns at the Sierra Brava Lodge, I managed to bag slightly more than 1,000 doves in a single day, but by lunch time, with about 500 birds in the bag, I had started to feel the repercussions of the 12 gauge. Beretta’s claims regarding lower recoil to the shoulder proved true, but the Kick-Off system was less effective on my face. Here’s why: the half-inch compression of the recoil pad into the stock moves the comb back-and-forth along the cheek. Unexpectedly, it was the cheek friction from that travel which proved the bug-a-boo for high-volume wingshooting. Meanwhile, my shoulder was fine – certainly the exception among Córdoba dove hunters. I had concluded that Kick-Off would be valuable even for grueling clays tournaments. If you were squaded up to shoot 500 clay targets in the course of a day, you’d really appreciate the Kick-Off technology. But if you’re firing 600 to 700 consecutive rounds of relentless, hot-barrel wingshooting during a single morning in Córdoba, you’ve reached the limits of Kick-Off on a 12 gauge. Beretta’s A400 Xplor Unico Light semi-auto with the Kick-Off. That said, however, I had opted to press my case and go for a 2,000-bird day at Estancia Los Chañares. Of the two Berettas, I believed the A400 Xplor Unico Light semi-auto would triumph as the shotgun for the job. The shotgun sported an after-market Muller Featherlight Choke. Muller’s extended chokes are manufactured from aerospace-grade aluminum infused with ceramic Teflon. Jim Muller claims his chokes are lighter than titanium. Instead of conventional constrictions, Muller’s chokes are designated Ü1- Ü4. I used a Ü2 opened to .012 inch for a hybrid improved cylinder/light modified pellet dispersement. Ready to go, the staff of Estancia Los Chañares would count birds and calculate averages, leaving my initial theory of 12-gauge overkill to play out both on the bottom line of a spread sheet as well as my Baby Boomer body. If you’ve never dove hunted in Argentina, you may be shocked to see men walking around lodges that cost upwards of $1,000 per day wearing diapers taped to their shoulders, trigger fingers and auto-loading thumbs wrapped in duct tape, and cheeks protected by layers of gauze and Vaseline. Toss out any rational explanation. High-volume dove hunting is the crack cocaine of wingshooting. Waterfowlers and the tweedy set savor the traditions and rituals. The hard-core dove hunters of Córdoba are addicted to the hand-held counter that resembles a stop watch operated by the indigenous bird boys. How many? Cuántos? Click, click, click… Did I get that one? Sí. Click. Muy bien, good shot. Click. Flats of shells are stacked up. The walkie-talkie is ready if you need more. Estancia Los Chañares was ripe for my challenge. 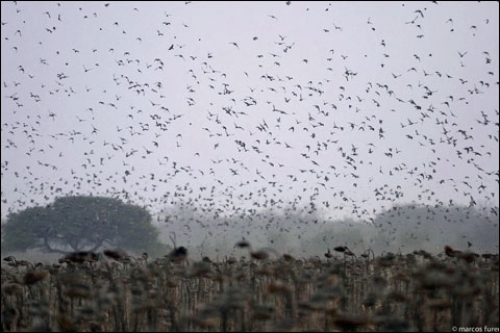 The 9,000-acres of private property occupy the Macha Roost, the largest in Argentina, inhabited by more than 20 million doves considered pestilence by the country’s massive agricultural industry. Since Flyways purchased Estancia Los Chañares in 2005, Mr. Perez and his team have implemented a year-round, game-management program stimulated by cultivating fields of sunflowers, wheat and sorghum. In fact, on the long driveway to the estancia, a rich plot of land fringed with blinds bared sunflower sprouts – promising superlative dove hunting only a five-minute walk from your room. The sunflower fields on the approach to Estancia Los Chañares. During the sunflower season, phenomenal dove hunting is a few steps from your room. After unpacking, Rick and I immediately set out for our first hunt of the day. While Sierra Brava keeps visiting groups together for the shoots, Estancia Los Chañares upholds the exclusivity by allocating only one bird boy and shooter to a blind unless otherwise requested. The truck drove us a few miles through thick foliage, leaving me at a brush blind set in a basin. The immediate area below the blind was recessed and further out was a modest rise. Trees and wild shrubs rose from the rear. The bird boy greeted me. 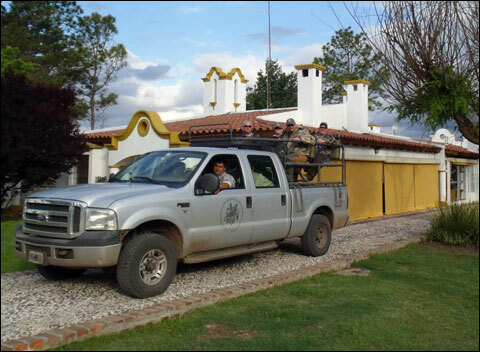 Hunters at Estancia Los Chañares are shuttled to nearby blinds in this truck that features safari-style seating. At first, it was nearly impossible to recognize the immeasurable number of doves in the air. They were very close and swarming like mosquitos. It takes a few minutes for your eyes and brain to finally work in unison in order to comprehend the inexhaustible number of birds occupying that basin. The bird boy stuffed the A400 Xplor Unico Light with 12-gauge shells. I started firing – registering one miss after another. I kept wondering: How is this possible? The answer soon became obvious. I was shooting into the crazy swarm instead of focusing on a single bird. I should have been picking a snowflake out of the blizzard. With that notion in mind, the birds started dropping as I spot-shot them. Generally, when we hunt birds here in the U.S. there’s a particular symmetry to the shots: incoming or crossing waterfowl, a quartering pheasant – or worst-case scenario a flushed covey of quail that demands immediate target acquisition among, let’s say, five to 10 birds. Now imagine literally being immersed in a wild bird mob that flares when you shoulder the gun. The A400 Xplor Unico Light handled quickly. Weighing about 6½ pounds, it swung with ease during some of my contortionist shots. By lunch, I had bagged some 650 doves – setting the stage for a 2,000-bird day. 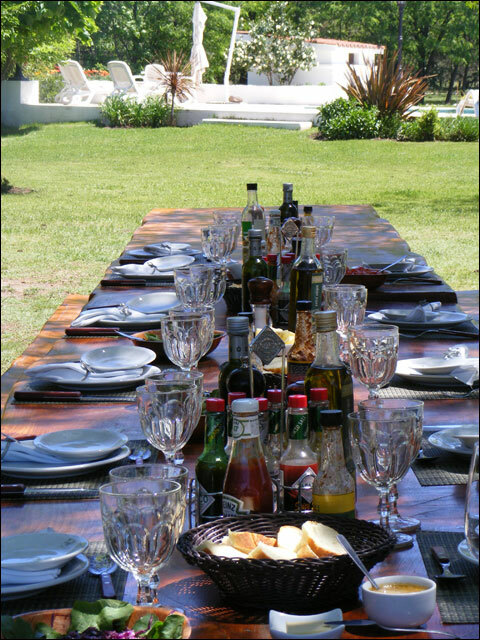 The table setting is ready for a hearty, outdoor lunch at Estancia Los Chañares. The truck circled around and returned us to the lodge. The chef was already at the outdoor grill packed with meat, a wonderful smoky fragrance wafting through the area on that temperate afternoon. We gathered at the picnic table for a feast of Argentina beef and chicken, abundant salads, wine and other beverages, delivered by the gracious servers. After lunch we retreated for a siesta. I opted for a poolside chaise lounge – a delightful breeze crossing the lawn. At 2:00 PM, we were back in the truck, which took us to different blinds. The bird boys had moved our gear. The afternoon location stood in direct contrast to the morning blind. I now looked out from a mountain top – a deep ravine below. The view unfolded tree-laden plateaus and undulating ridges. A wind of about 20 mph acted as an afterburner on the doves, and I figured that if I couldn’t get the balance of the 2,000 under these conditions, at least 1,000 for the day seemed plausible. The view from the mountaintop blind at Estancia Los Chañares. Compared with the morning hunting spot, the birds here were driven by the wind and scattered over a wider distance. From the edge of the cliff, birds would pop up like a jack-in-the box and swerve past me on the wind – meaning that once you established a bird the shot involved spinning around in an attempt to get it rocketing away. Incomers were easier, but the shots had to be established long before the birds got close enough to flare off on the wind whenever I shouldered the shotgun – for plenty of 30-40 yard shots. Doves crossing in the ravine also presented long, crossing shots. Soon, I picked up the rhythm of the place. In particular, by focusing on long incomers I could mitigate the vagaries of the wind. I would line up the bird over the front bead and trigger the shot. Another shot I mastered involved spinning to the right, over my shoulder just as a dove emerged from the other side of a nearby shrub where it couldn’t see the gun. If I saw the bird disappear behind it, I figured out how long before I could come out the other side. The crossing shots in the ravine involved more practice using the swing-through technique, but the incredible volume of these shots let me master them fairly quickly while proving the that the Mulller choke patterned quite well at 30-40 yard range. The Beretta’s A400 Xplor Unico Light reminded me of the acrobatics you would see on stunt planes. It’s low weight, ideal center of gravity, intuitive trigger and recoil absorbency at the shoulder fostered an aggressive tempo that the bird boy helped maintain with his rapid loading skills. Still, my cheek grew sore from the comb’s friction. One key to achieving a high dove count in Argentina is the ability to determine a consistent rhythm and stay with it. Fast target acquisition is vital. You need to immediately identify the most viable shot among the thousands of birds and commit to it. Never sit down. Pause for water breaks only. Vary your shots to prevent monotony. You need to constantly be stimulated and dialed into the action. Some people might call it a Zen state – a gorgeous day on the mountain top, birds everywhere, the instant gratification of seeing one fold, the hyper-vigilance, adrenaline rush – click, click, click. I kept asking the bird boy How many? Cuántos? and I saw the number continuing from the morning hunt toward 2,000, until once when I asked he showed me the counter: 2,016. I stopped. We shook hands. The blind was strewn with empty hulls, shotgun shell boxes and few doves that had fallen nearby. Suddenly, the blind was quiet. The wind carried the muted blasts of fellow hunters at Estancia Los Chañares. Dinner that night featured delicious steaks, salads, vegetables and Malbec wine. The irrepressible Alex Mitri, managing partner Estancia Los Chañares, served as the master of ceremonies by announcing the day’s scores and rewarding the hunters with hats and shirts of specific denominations. I received my Estancia Los Chañares 2,000 hat. So what did I learn about using a 12-gauge shotgun for high-volume dove hunting in Argentina? I would not use a telescoping recoil system. I believe the A400 Xplor Unico Light would have worked better without it. Moreover, the lack of felt recoil to my shoulder with the Kick-Off led me to believe that the overall design of the shotgun would have delivered softer felt recoil over most other semi-autos anyway. If I did it again, the standard A400 Xplor Unico Light would be my top choice. The best 12 gauge to use for this type of hunting is a semi-auto with a custom-fitted stock. I believe a shotgun like that would be far more comfortable than any subgauge rented by the outfitter. Upon checking out, Estancia Los Chañares gives you a spread sheet of everyone’s individual performance. Over two days, I harvested 3,197 birds using 153 boxes of shells – for an accuracy rate of 84%, which was the highest of the entire group. At this point, I want to emphasize again that I don’t consider myself an exceptional shot. The point of this exercise was not to rack up bragging rights, but to test a premise. Rick, who I consider a far better shot than me, was the runner up with 2,723 birds from 136 boxes of shells for an 80% accuracy rate using both a 20 and 28 gauge. Third place registered 77% with 3,334 birds from 173 boxes of shells. Strictly from the perspective of high-volume hunting in Argentina, I left convinced that 12 gauge was the bore of choice. Wingshooters could easily argue that the big shotgun was less sporting than the smaller gauges, and of course they are right. 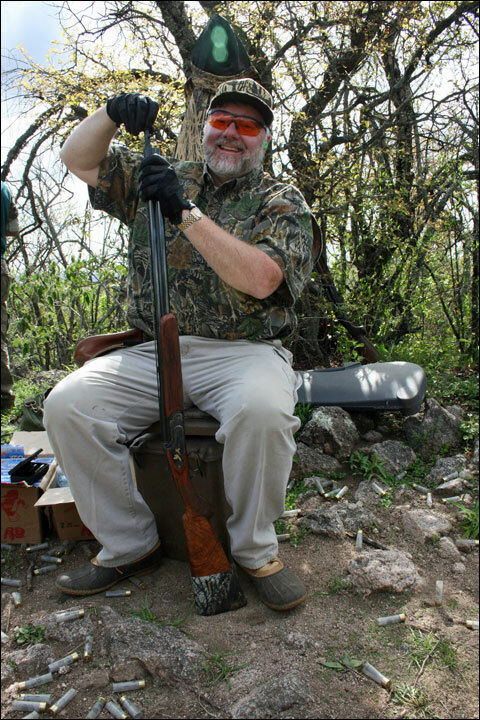 Recently, Rick and I were driving north one morning for a day of sporting clays. Our plan called for about 250 targets at two different courses separated by only a few miles. We talked about upland shooting in England, when he said that for the money he would choose Argentina in a heartbeat. I said that they were two different experiences.